Thecus N4510U-PRO-R 8TB (2 X 4TB) Seagate Enterprise Drives, Intel Atom 2.13GHz Dual Core Processor, 2GB DDR3 Memory, USB 2.0 host port x4 (back x4) USB 3.0 host port x2 (front x2), RAID 0/1/5/6/10 and JBOD, VMware compatible. Time marches ever on, and Thecus® is ready to keep pace with its latest revision to the award winning SMB 4-bay rackmount line: the N4510U PRO. With a nearly 15% rise in processing speed thanks to the Intel® Atom™ D2701 processor and a stylish new front panel, the new N4510U PRO can begin future-proofing your business this November. Doris, the CEO of a design startup, has watched as her dreams became reality and then some. Starting out small with renovations and interior design projects for friends and family, she found her approach of revitalizing the past to be a hit. The word spread and now she found herself at the head of 20 employees expanding to new premises in a month. Given the continuing growth of her business and the storage needs of hundreds of large Photoshop files, Doris has decided to invest in a rack system. Because of the N4510U Pro’s vast array of software (such as Data Burn, which allows Doris to conveniently burn copies of her designs onto discs for clients, and a free copy of Acronis True image, for storing her employees work securely on her home NAS) and hardware features (for example the HDMI output, which means easy design sharing on the office HDTV), she confidently commits to her first of three Thecus® rackmounts. It’s coming to the end of the year and Michelle, an IT specialist, needs to improve the performance of her network with a limited budget. She’s sure she could get the performance she needs out of an Intel® Core™ powered NAS, but the economical goals set by her manager don’t allow for it. After reading some positive review of its predecessor, Michelle decides to add another Thecus® NAS to her company’s IT infrastructure. She knows that with the N4510U PRO’s iSCSI Thin- Provisioning, overheads will be kept low, there will be reduced energy consumption and heat generation, and that all the while she’ll be clocking in higher data transfer speeds. Thanks the unit’s VMWare certification, Michelle can also make the most of virtualization technology. Through this, she can ensure even greater energy efficiency, as well as improved system consolidation and simplification. And to top off all the savings Michelle has been able to make, she proudly finishes her quarterly report with a note that the system came bundled with a free copy of McAfee antivirus. What sets Thecus® products apart from other similar devices, besides years of experience and numerous world firsts in the storage industry, are the modules (apps) that expand the functionality and extend the applicability of their NAS. Since the recent unveiling of the App Center this August, Thecus® has consolidated a database of over 200 frequently updated official and third-party modules. By sharing nearly double the number of modules as their nearest competitors, Thecus® users can be sure that they’re getting a device with growing versatility and continued relevance in an ever-changing world. Thanks to its proud history, the new N4510U PRO brings with it a proven feature set. Now with a brand new heart, this trusted workhorse is ready to carry your business into 2014 and beyond. Make your NAS into the ultimate multimedia hub! The N4510U PRO HDMI output allows you to connect your NAS directly to your TV for device management. When it comes to data management, Thecus NAS truly let you have it your way. Create multiple RAID volumes each supporting different RAID modes including RAID 0, 1, 5, 6, 10 and JBOD for your own balance of performance and data protection. Should a hard drive malfunction occur, changing one is simple thanks to online RAID migration and expansion, hot spare, and auto rebuild. 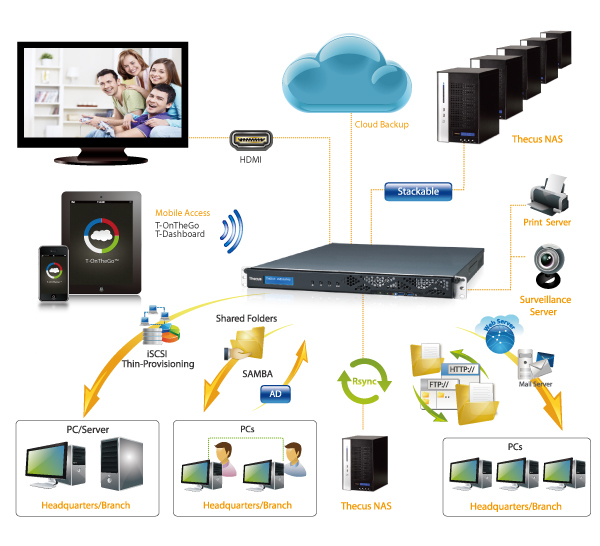 Divide the massive storage of a Thecus NAS among multiple users. Whether there are two users or 100, user quotas make it easy to divvy up and manage disk space. User Interface Web-based user interface supports English, Traditional Chinese, Simplified Chinese, Japanese, Korean, French, German, Italian, Spanish, Russian, Polish, Portuguese. Auto Module Installation Thecus’ module server automatically provides the latest modules and updates through the user interface.